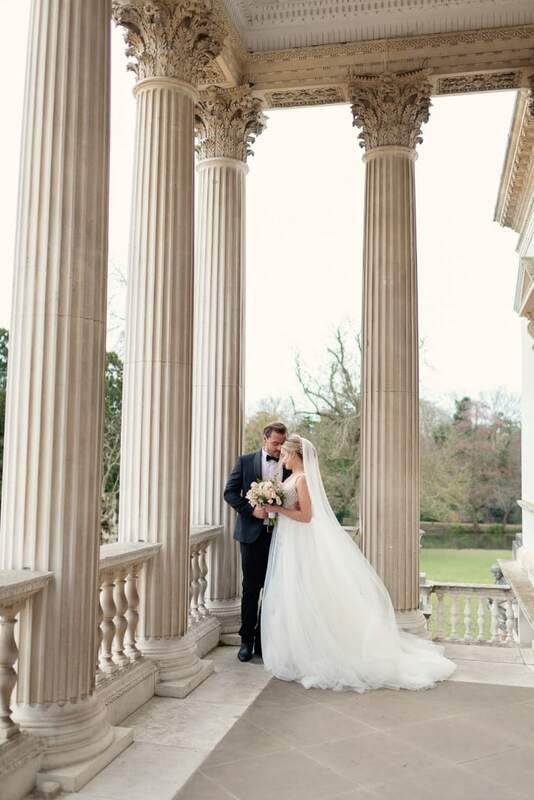 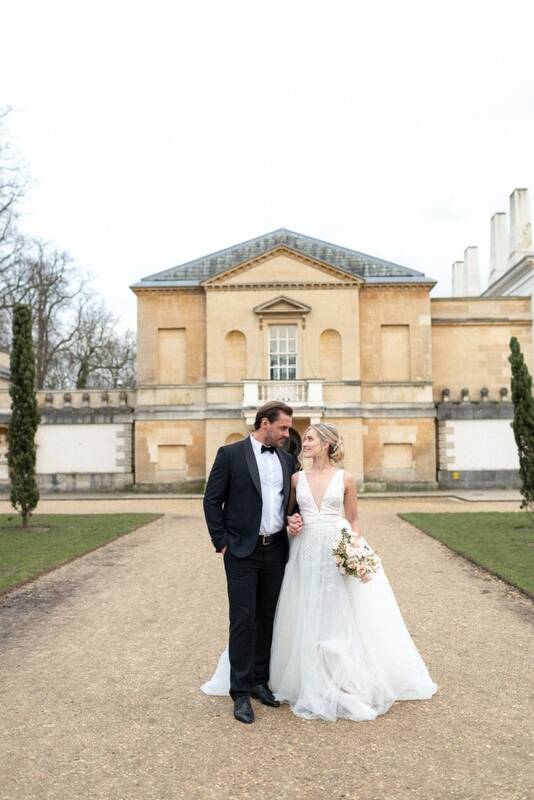 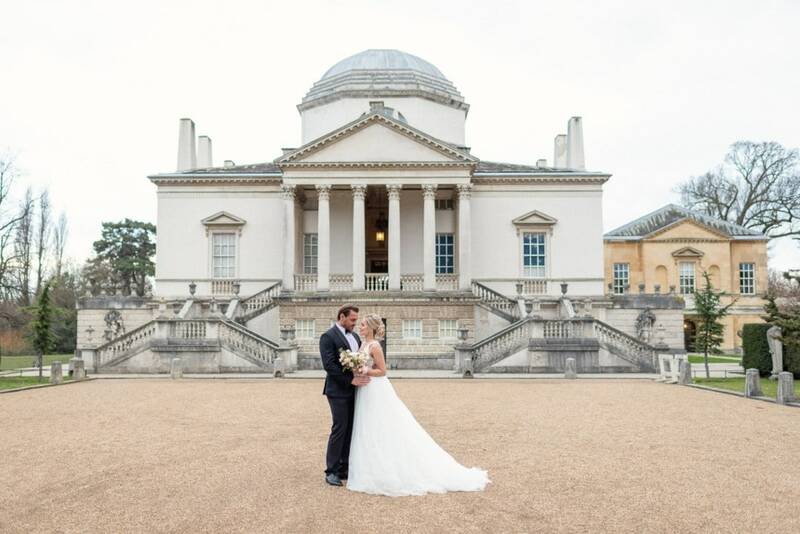 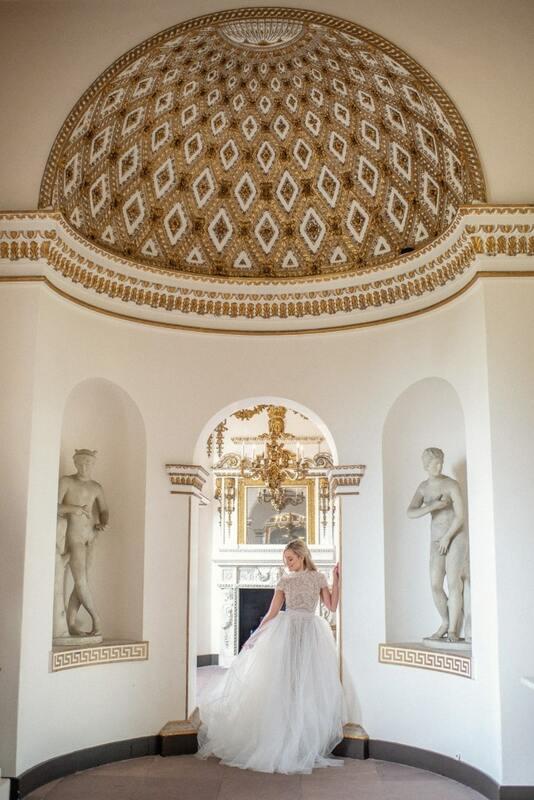 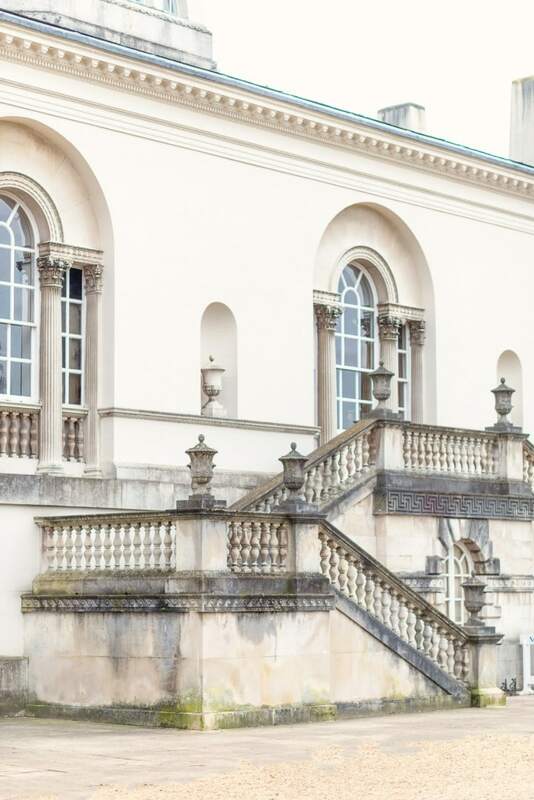 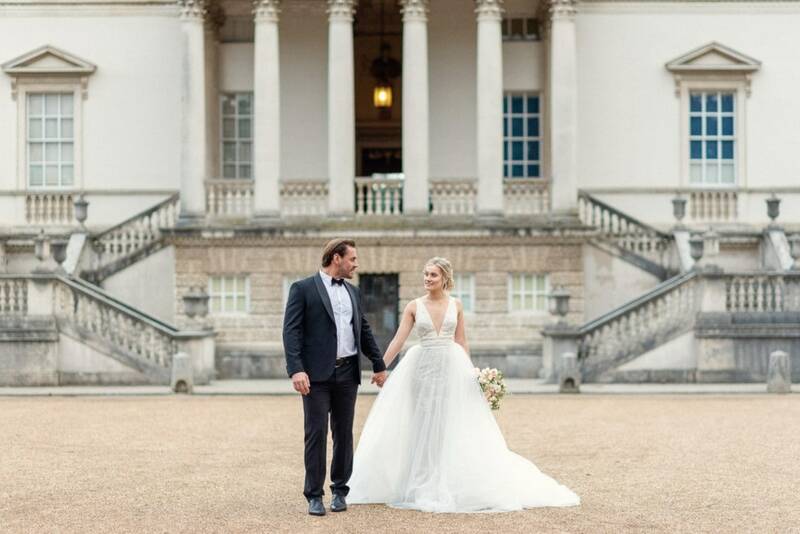 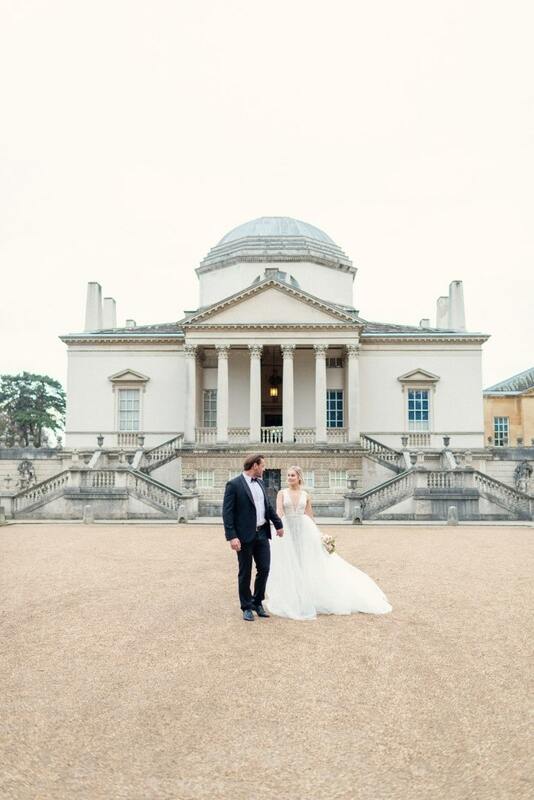 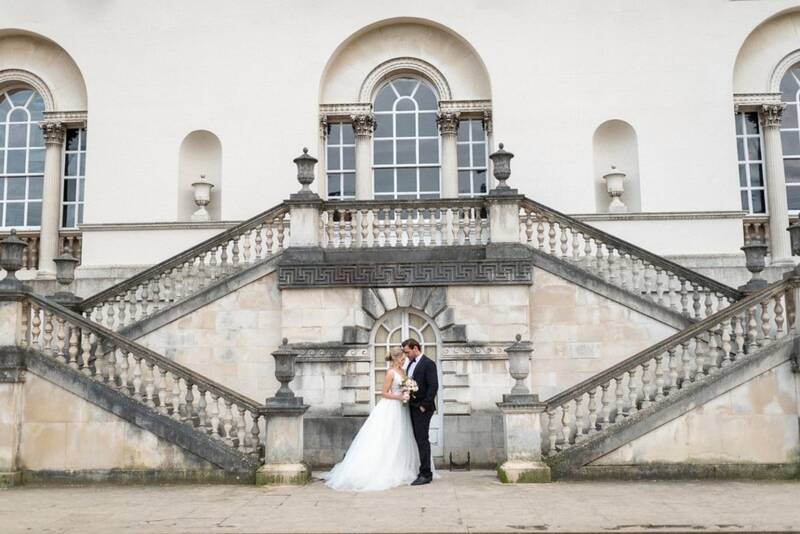 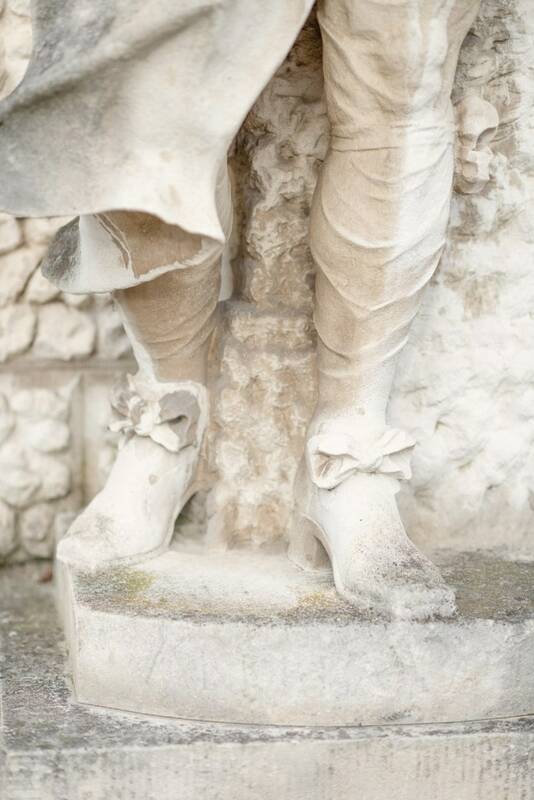 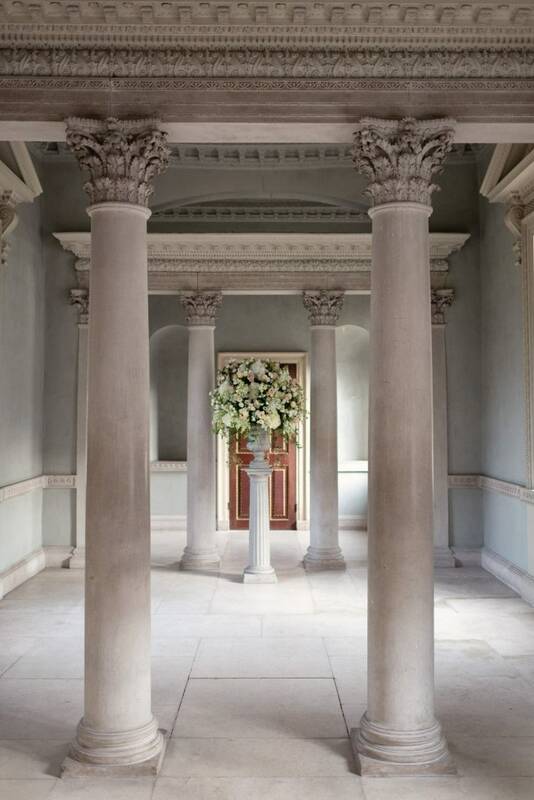 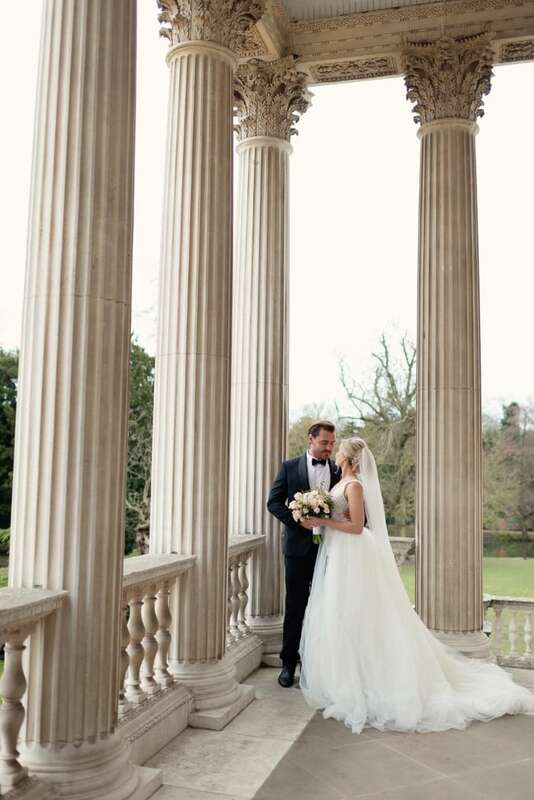 This styled editorial is centred around the beautiful Italian inspired architecture of Chiswick House. 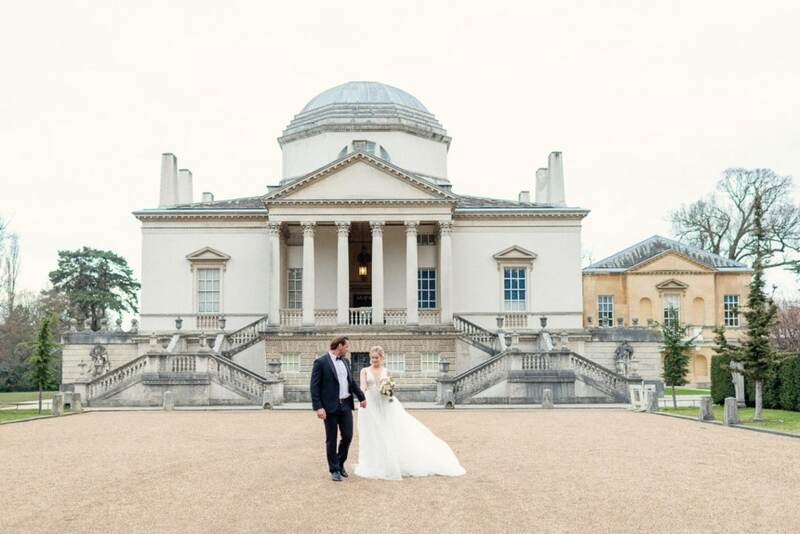 The historic venue was designed by the Third Earl of Burlington, who was inspired by his tours of Italy through the 1700s and the architecture of Andreas Palladio, one of the greatest Architects of his time. 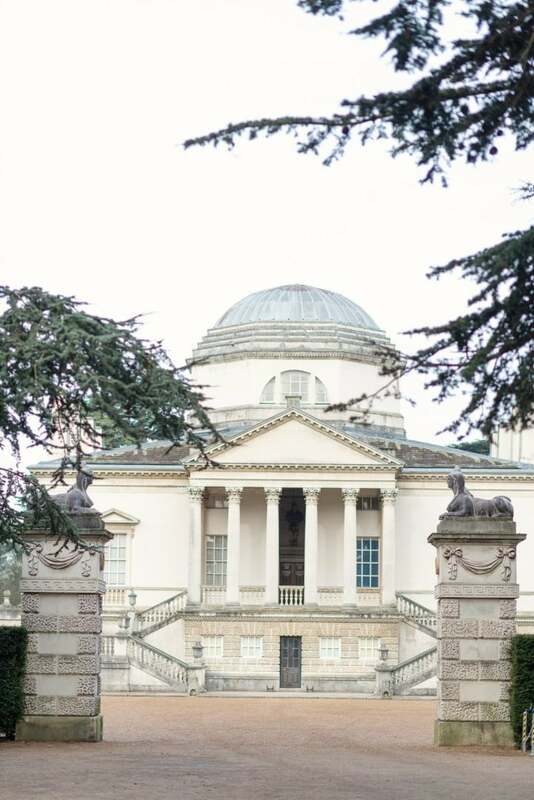 Our shoot focuses around the fictional love story between Lady Elisabeth, the daughter of The Third Earl of Burlington and her suitor, Prince Andreas. 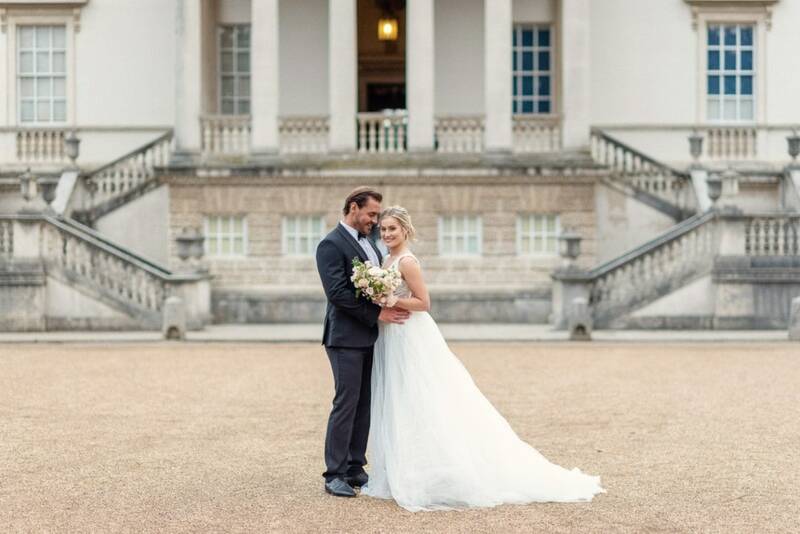 Elisabeth met Andreas when on a Grand Tour of Europe and they immediately fell in love. 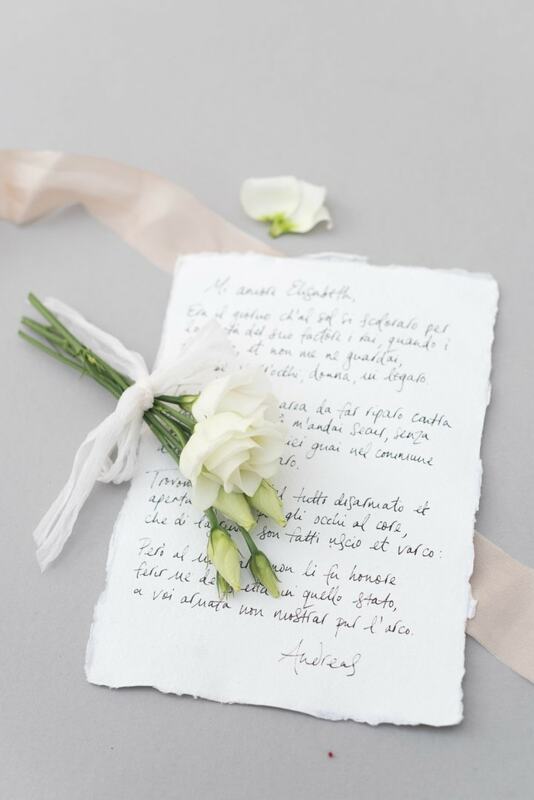 Upon her return to England, Andreas wrote frequently to Elisabeth who always started his letters with ‘Mio Amore Elisabeth’. 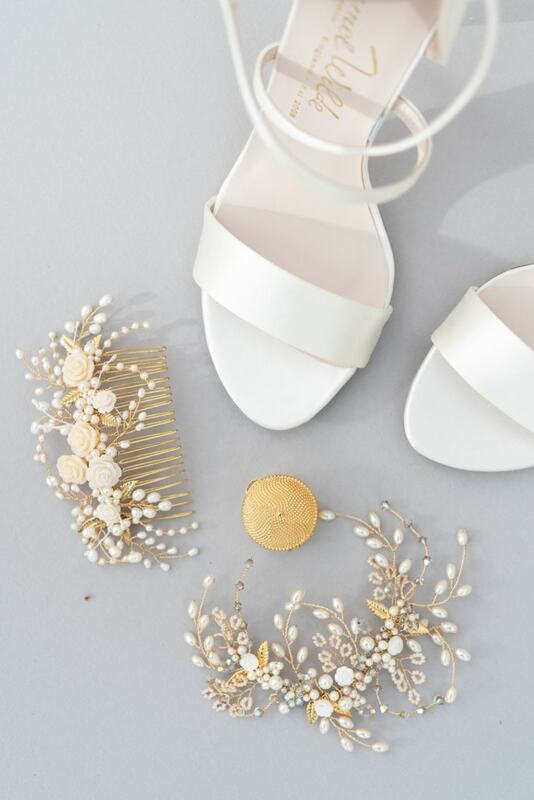 The shoot is styled around feminine and romantic details. 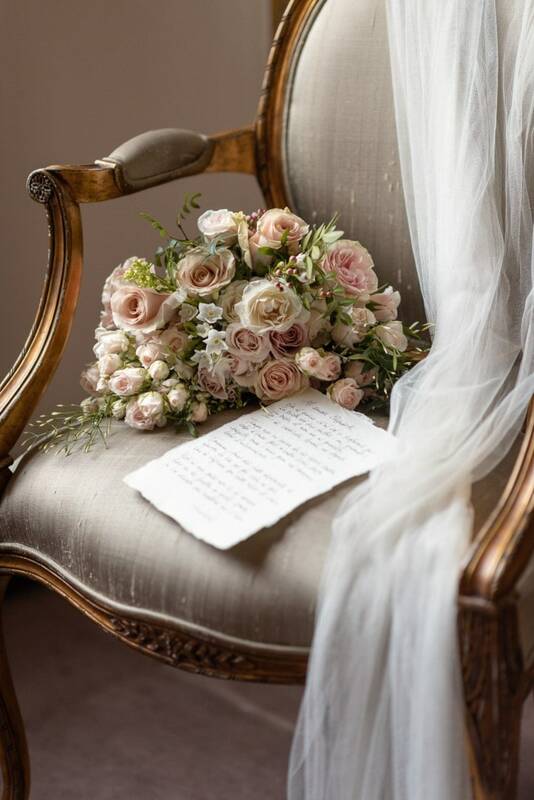 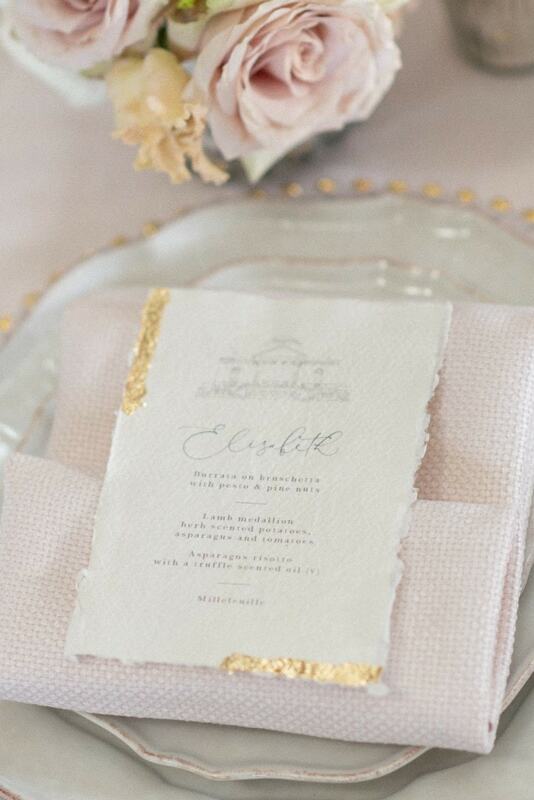 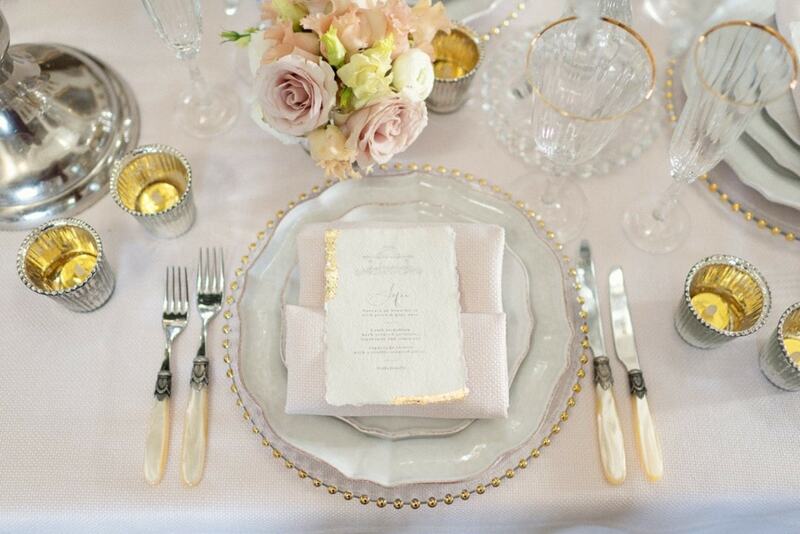 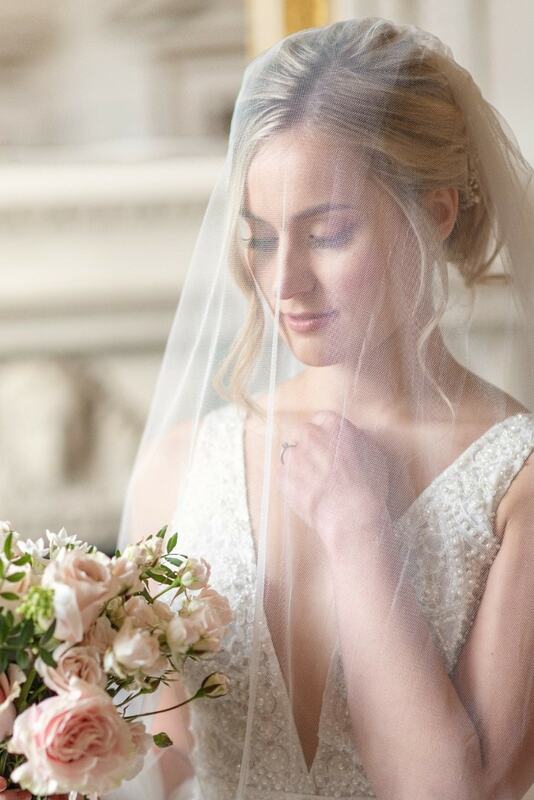 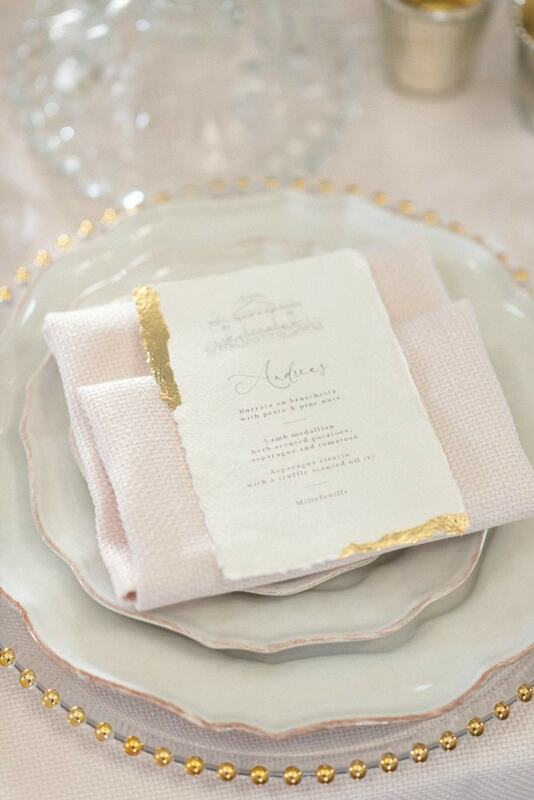 We used a colour palette of soft pinks and neutral tones paired with gold details to reflect the romantic and classical feel of this shoot, combined with a Fine Art aesthetic. 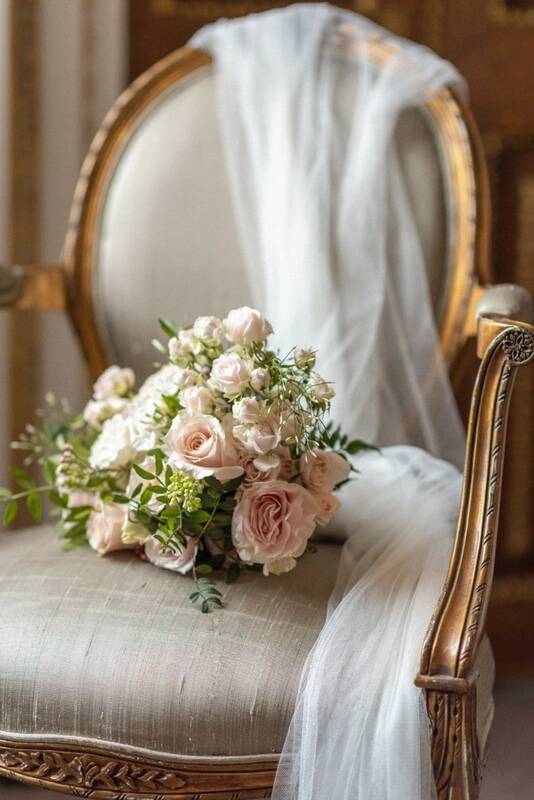 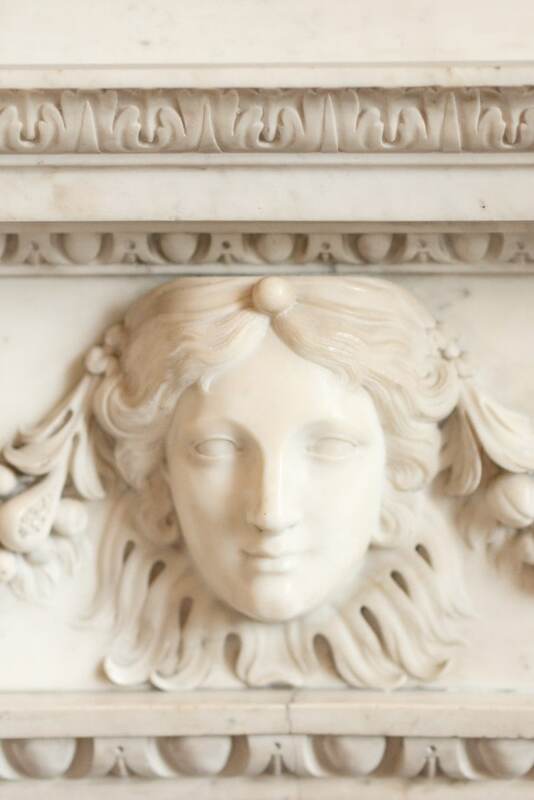 Our vision was to create something that reflected the historical nature of the building while also being romantic, graceful and feminine with lots of beautifully styled details. 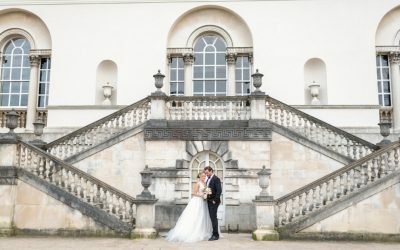 The entire story was captured on film by Hand Craft Pictures. 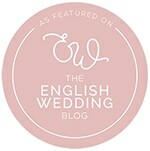 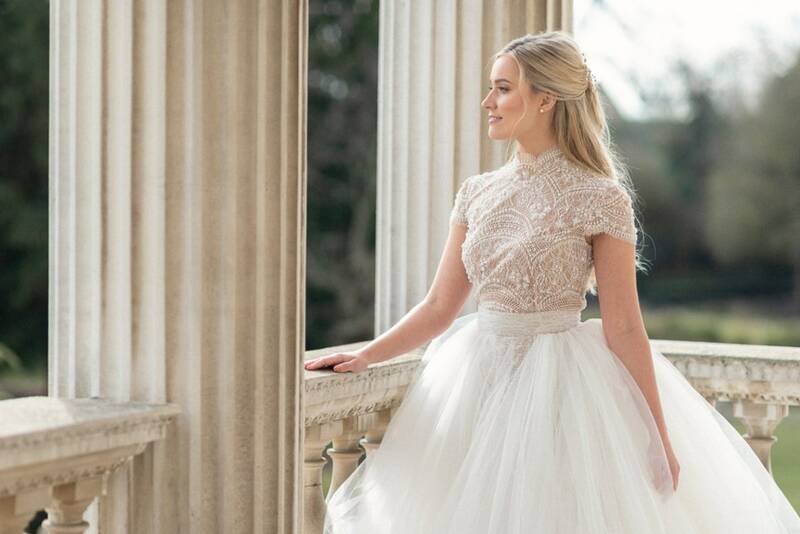 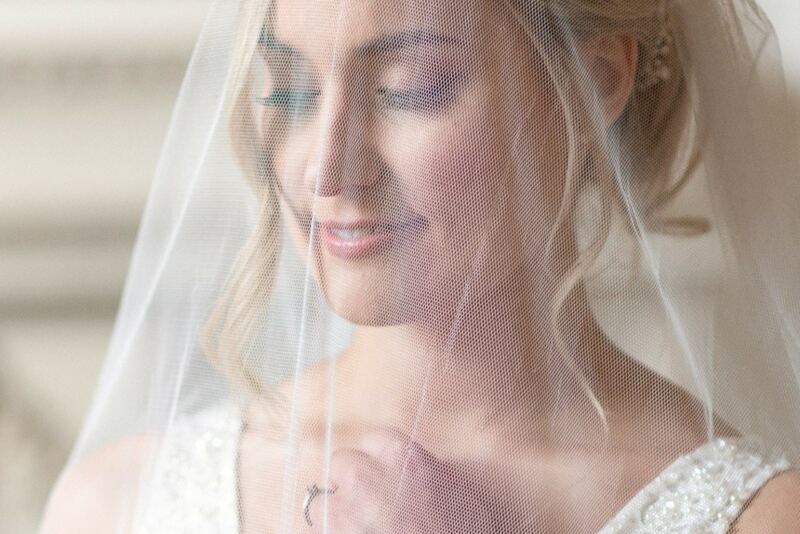 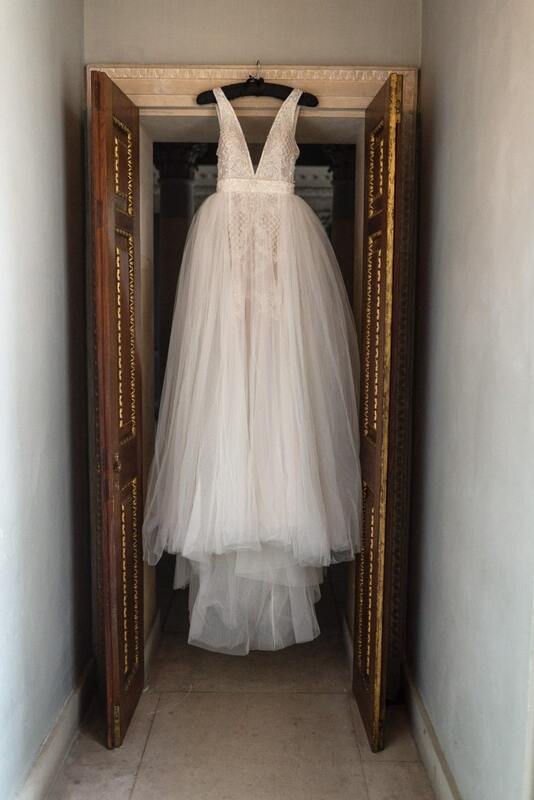 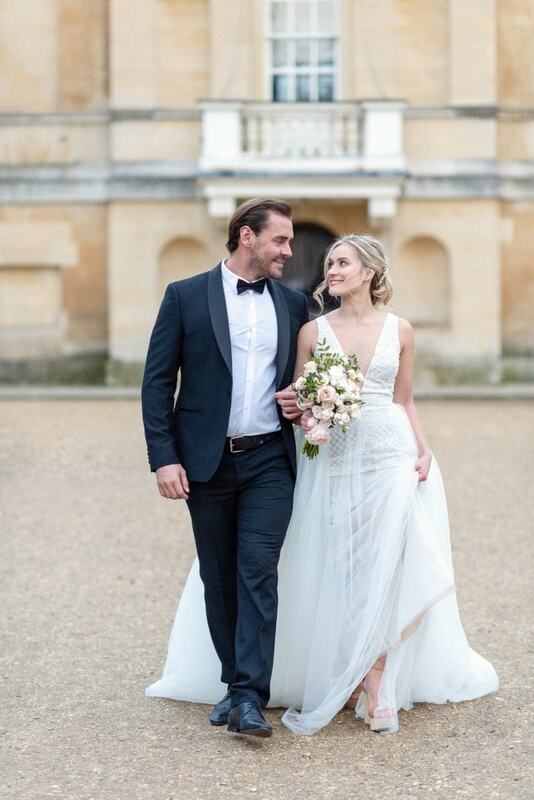 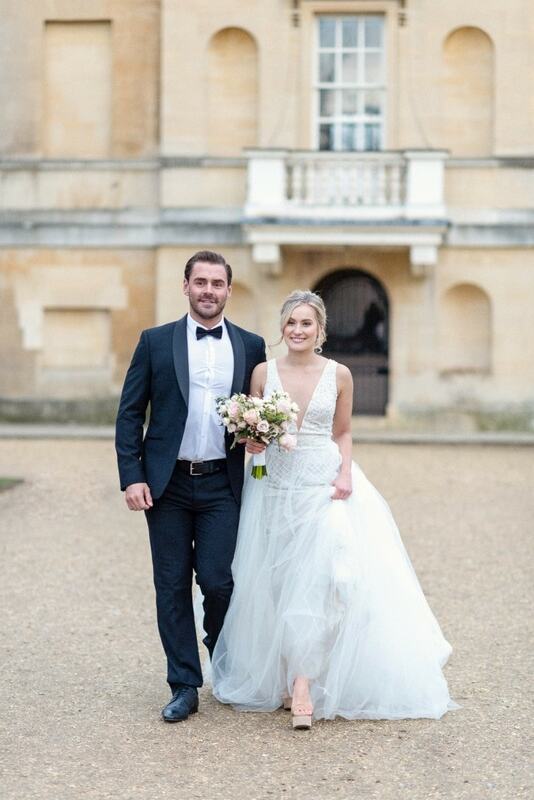 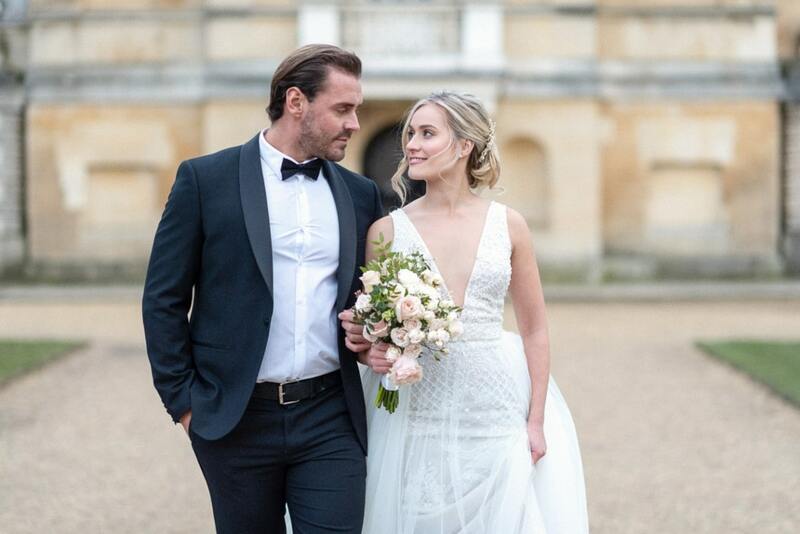 Our bride is professional ballet dancer Tamra Burke who wore exquisite dresses from Morgan Davies Bridal. 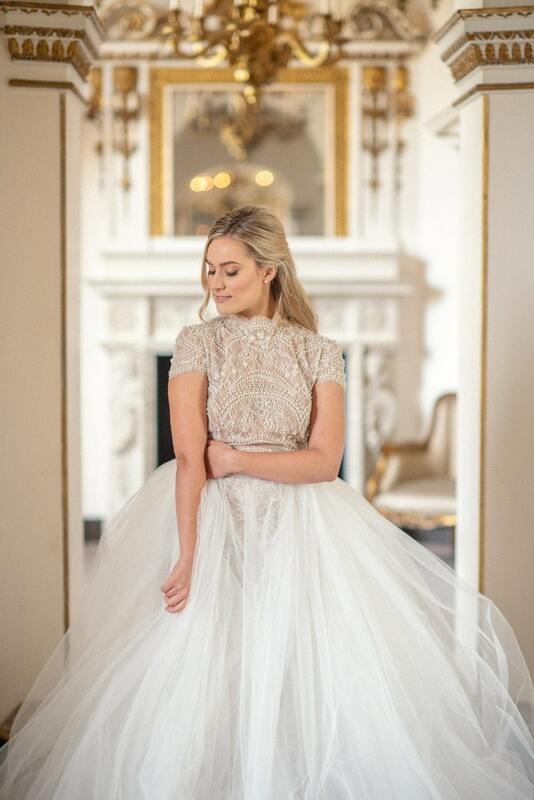 We chose two different looks with very feminine details; Tulle skirts with beautiful hand embroidered pearl and crystal detailing. 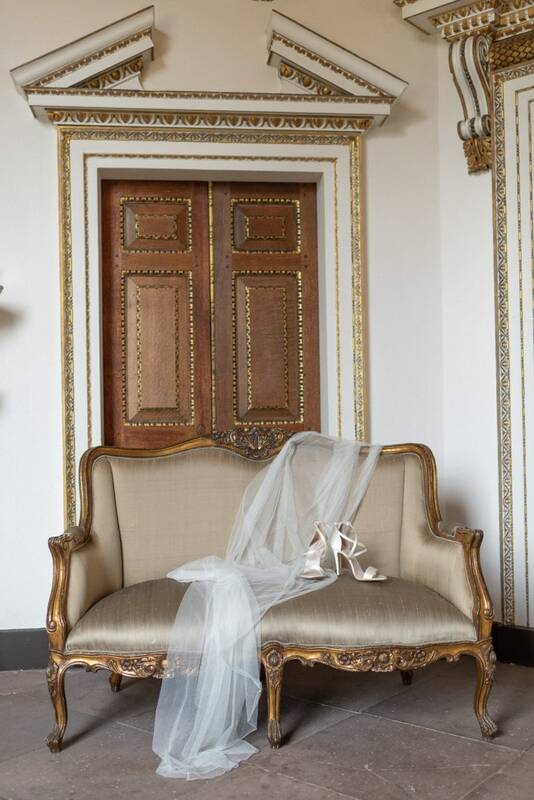 The dresses were paired with simple yet elegant shoes by Harriet Wilde. 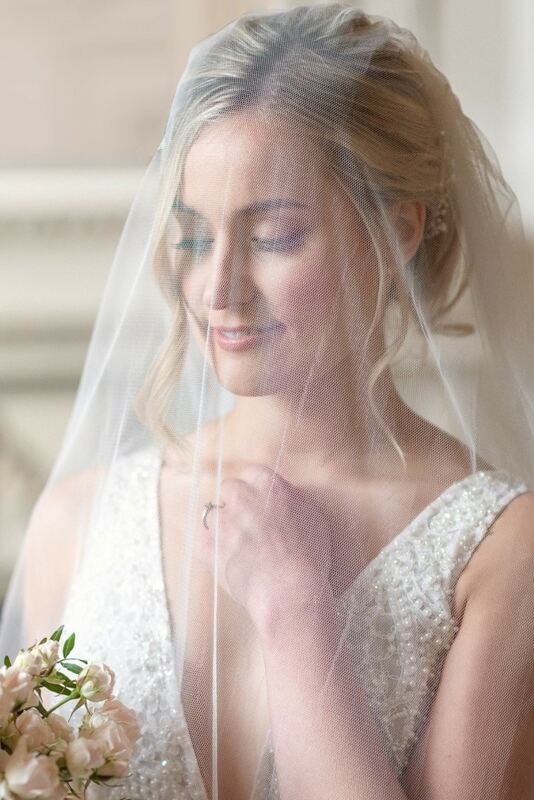 Hair and make up were styled by Alison Jenner Hair, who created a soft English Rose look, complimented with gorgeous accessories from Clare Lloyd Accessories, courtesy of Poppy in Pearls. 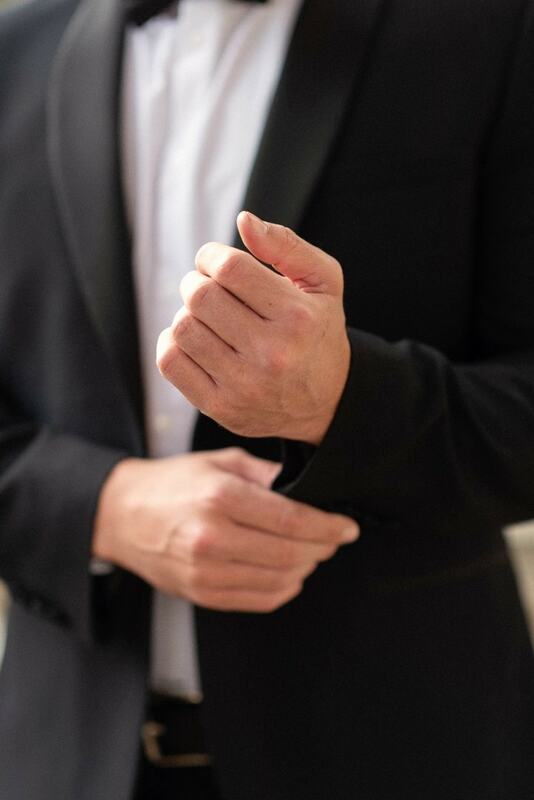 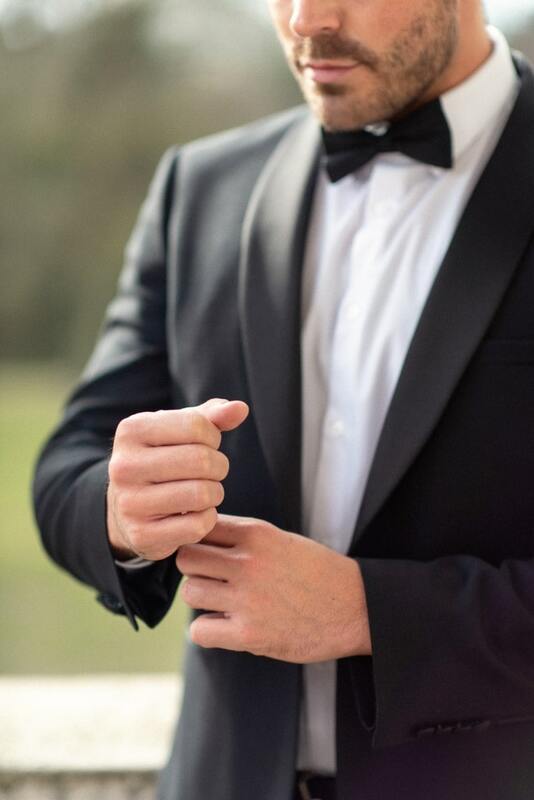 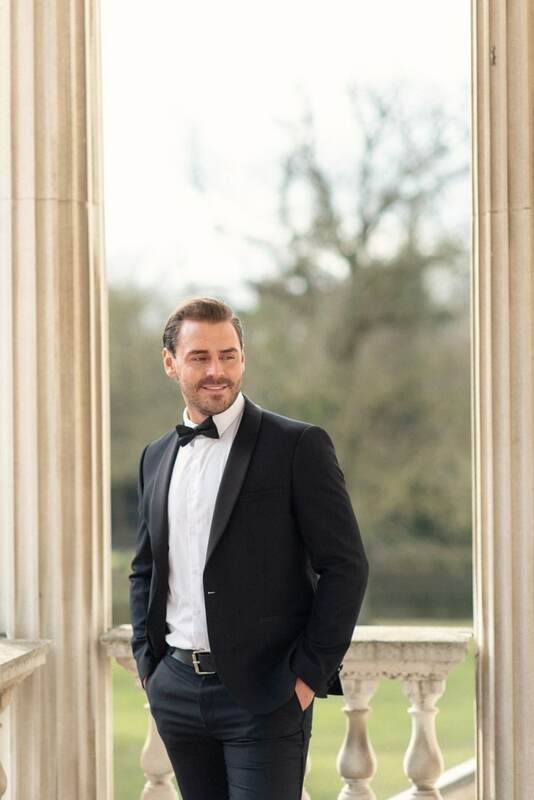 For our groom, model Stuart Compton, wore a classic tuxedo. 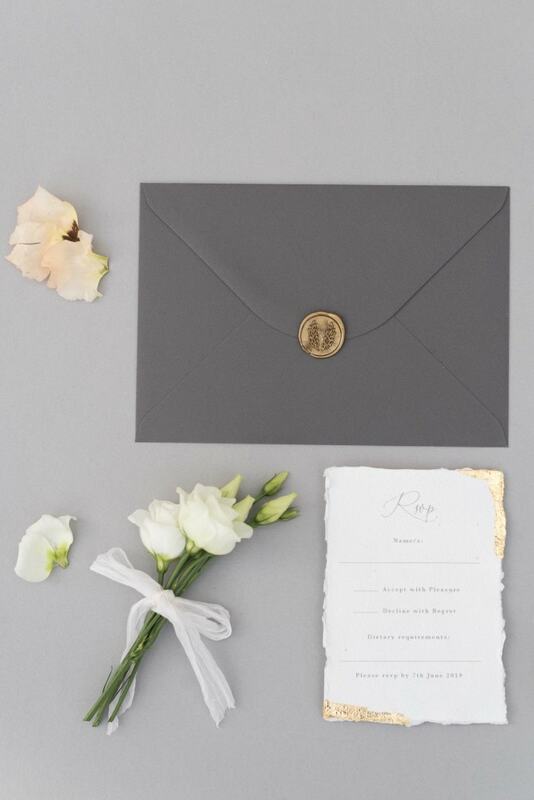 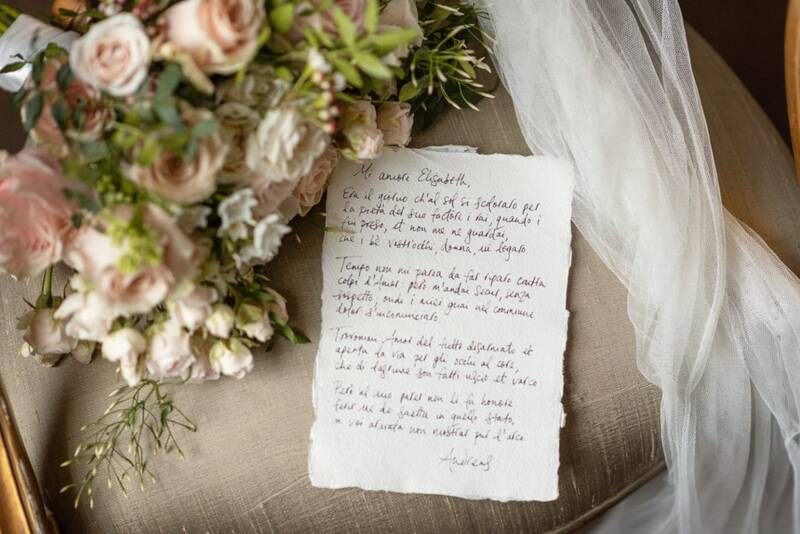 The love letter you see in the shoot, along with the rest of the beautiful stationery was created by Dimitria Jordon who used hand crafted paper and gold foiling. 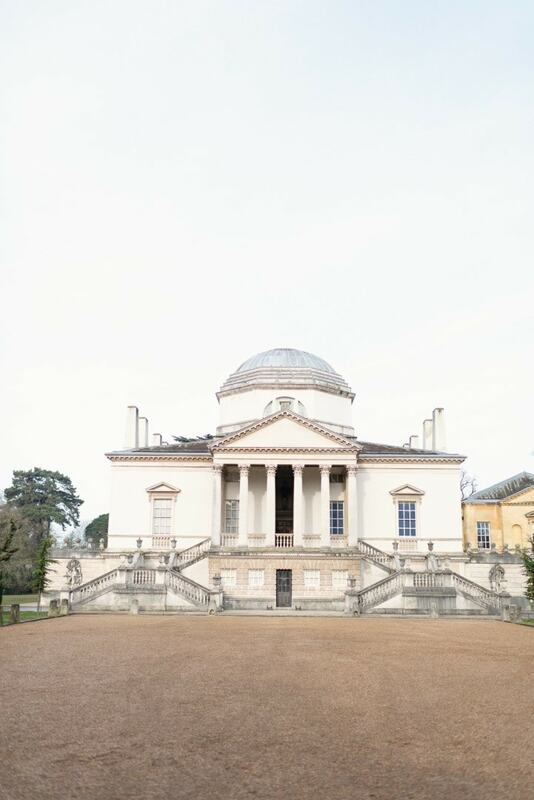 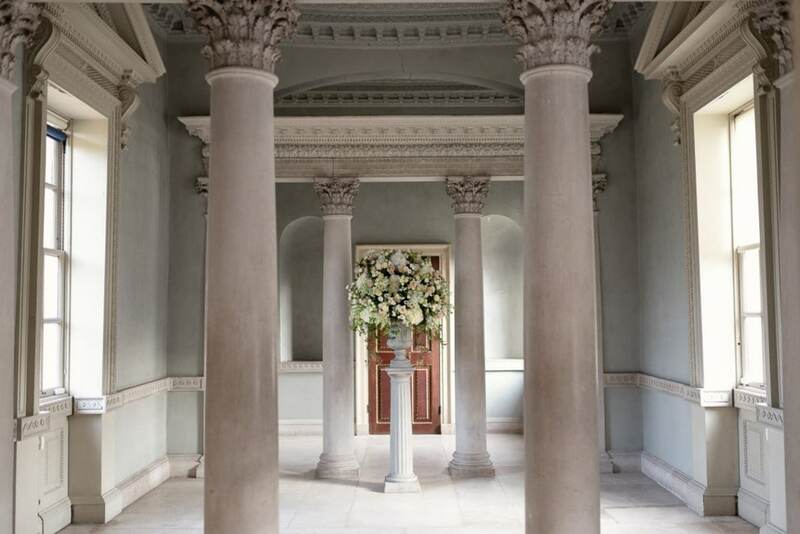 The cake featured in the shoot was created by Lauren of The Honey Bee Wedding Cake Co and takes inspiration the design of Chiswick House. 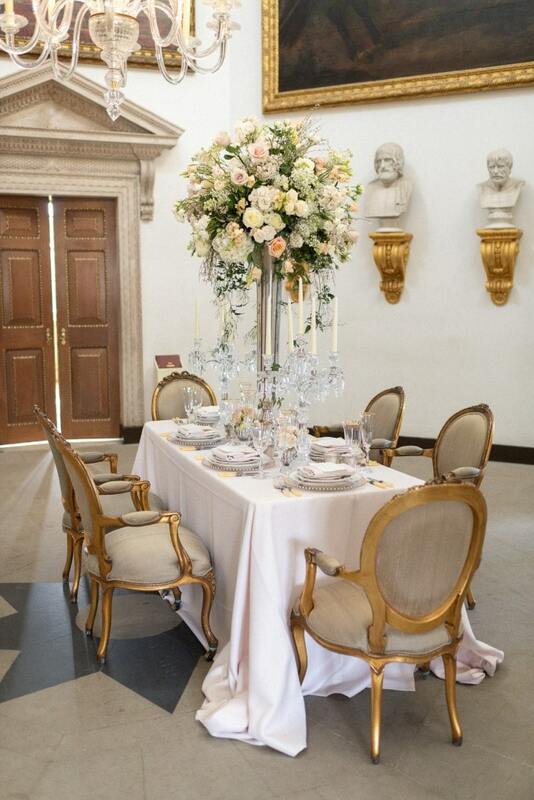 The six tiers with a neutral colour palette with gold baroque detailing to reflect the grandeur of the building. 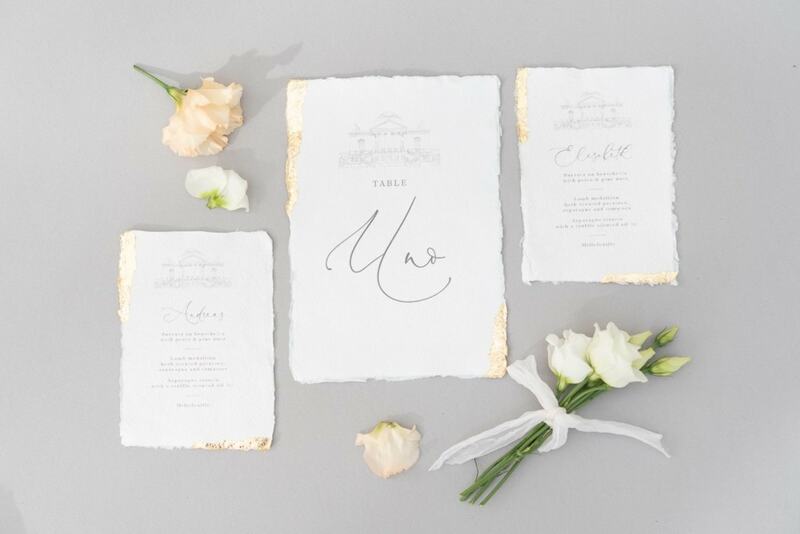 To tie in with our tale of Italian romance, Lauren had painted the word ‘Amore’ onto ripped fondant, edged with gold foil which matched the beautiful stationery. 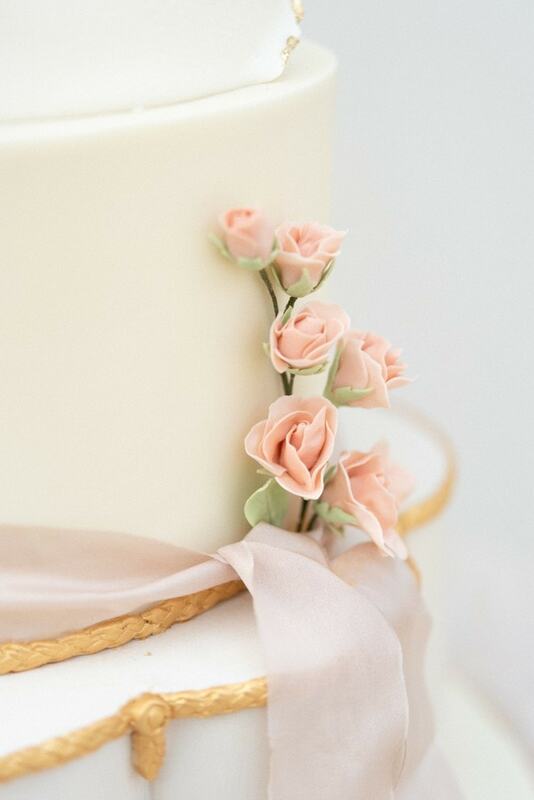 The cake was adorned with delicate English climbing roses handmade from sugar to represent Elisabeth and the beautiful Roses grown in the gardens of Chiswick House. 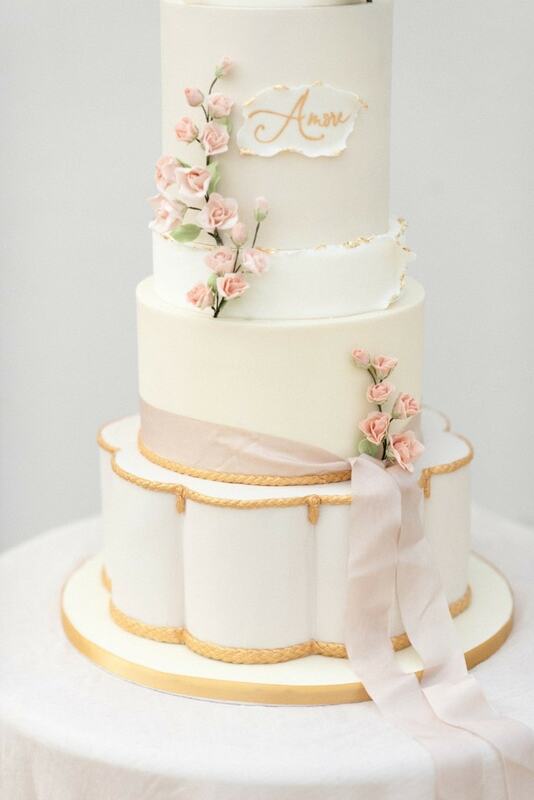 The cake was completed with a beautiful ribbon from Silk and Purl. 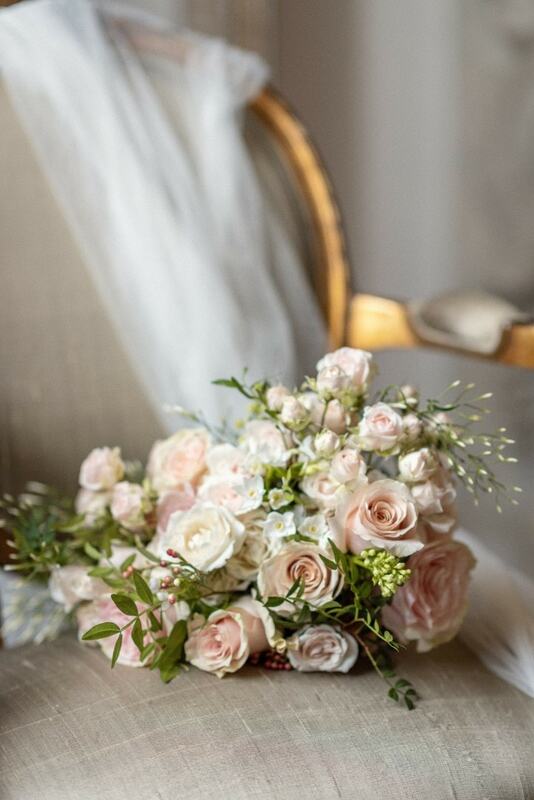 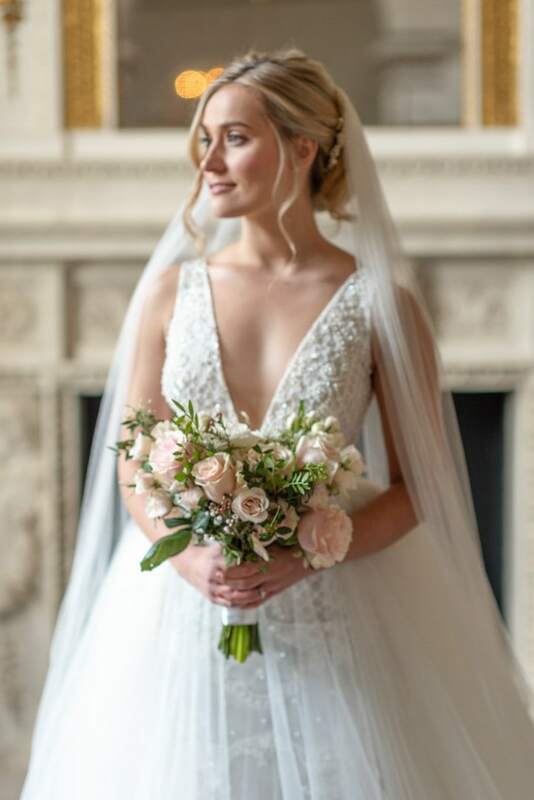 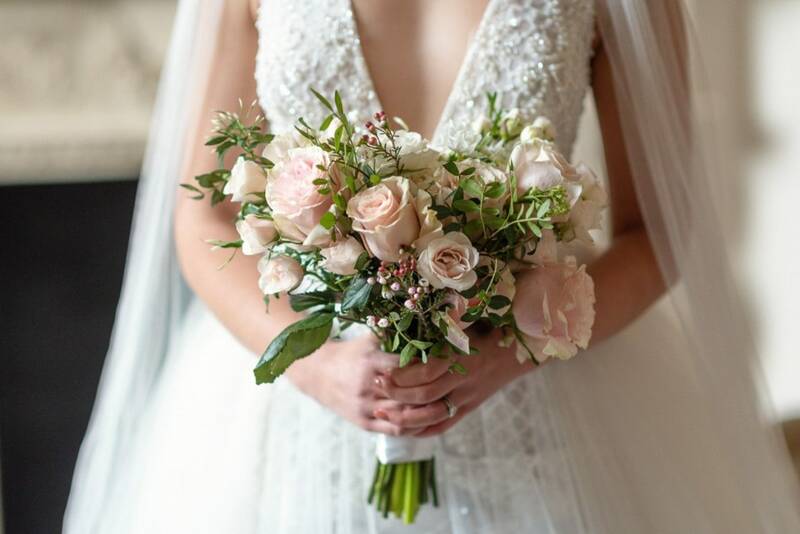 The floral design for the shoot is by Mary Jane Vaughan, an award winning London Florist, who worked with our colour palette to create something magnificent! 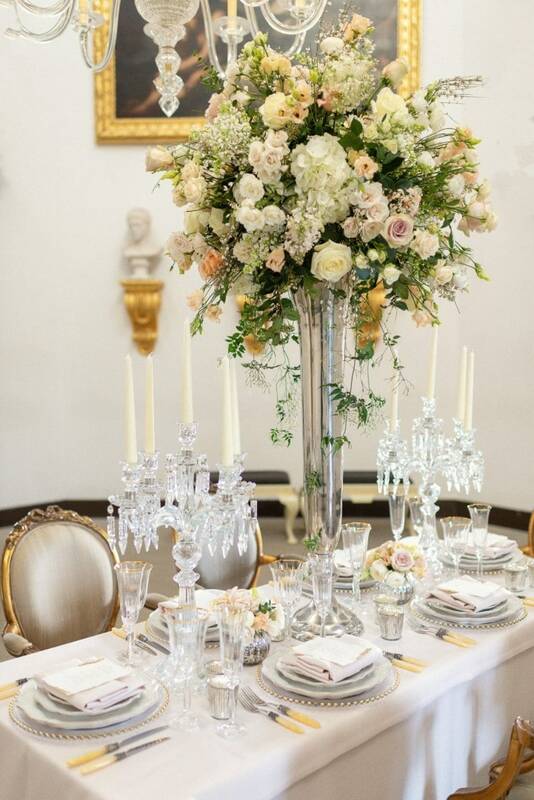 For our table, Mary Jane created a stunning centre piece featuring Lilac, Hydrangea, Jasmin and Roses. 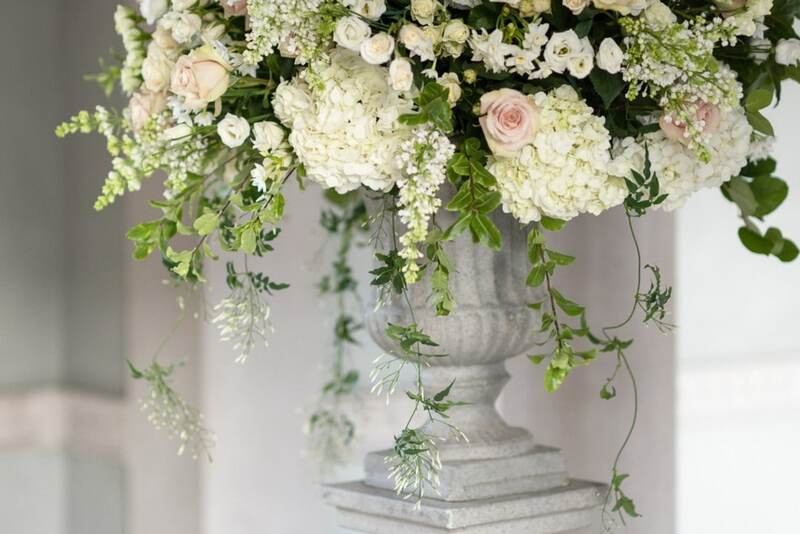 in soft pastel tones with trailing foliage. 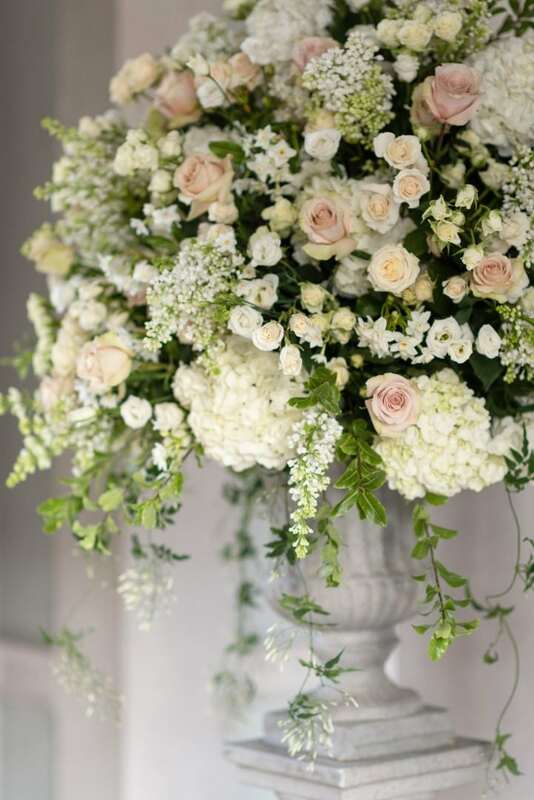 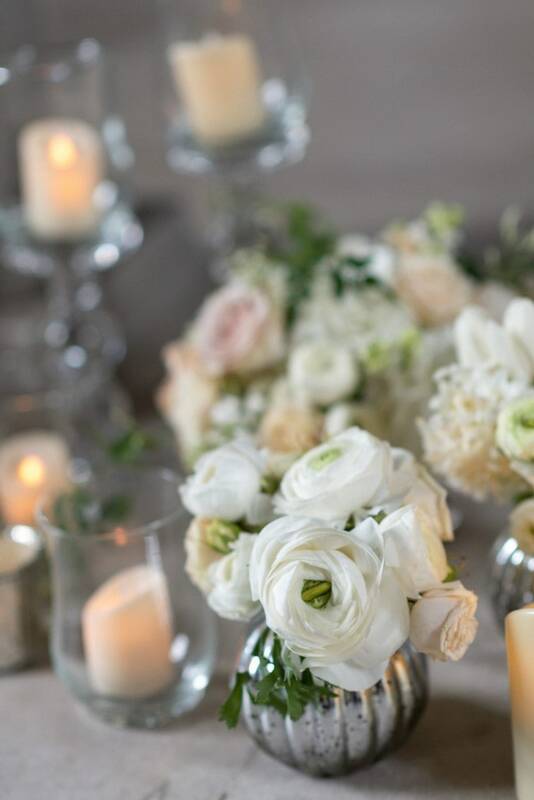 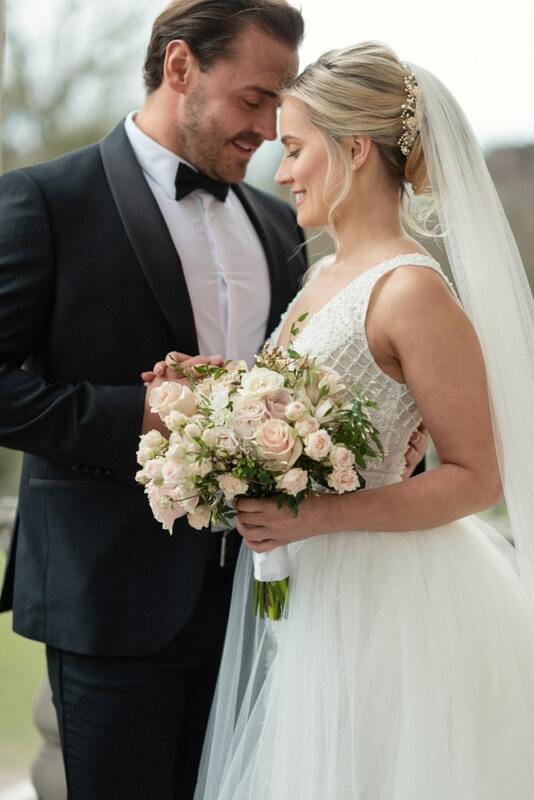 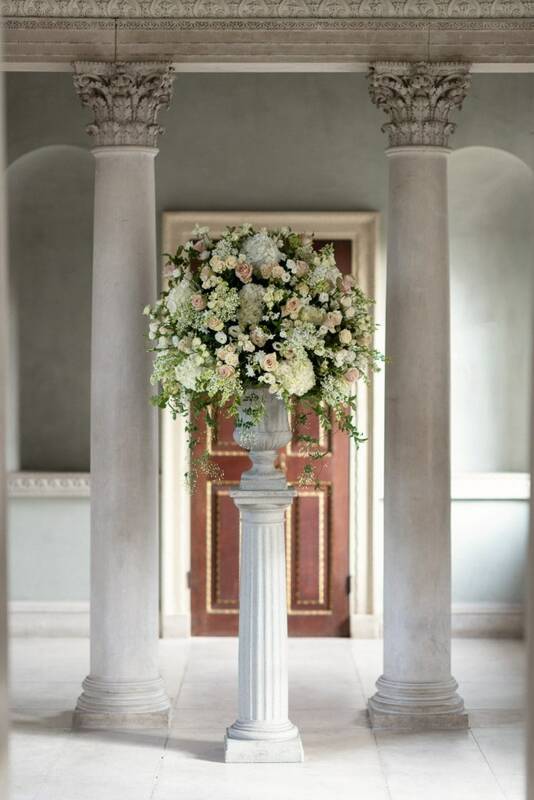 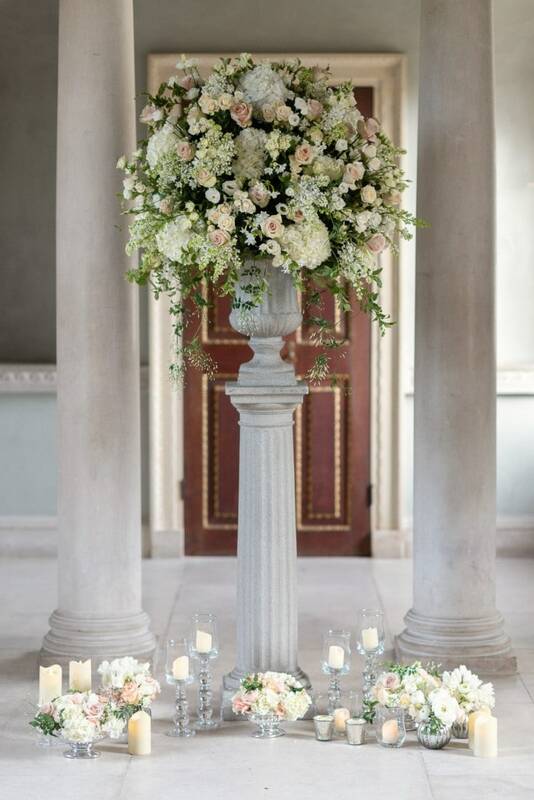 Mary Jane also created a stunning arrangement for the ceremony room with a natural stone urn coupled with smaller individual arrangements and lots of candles to create a romantic and intimate feel. 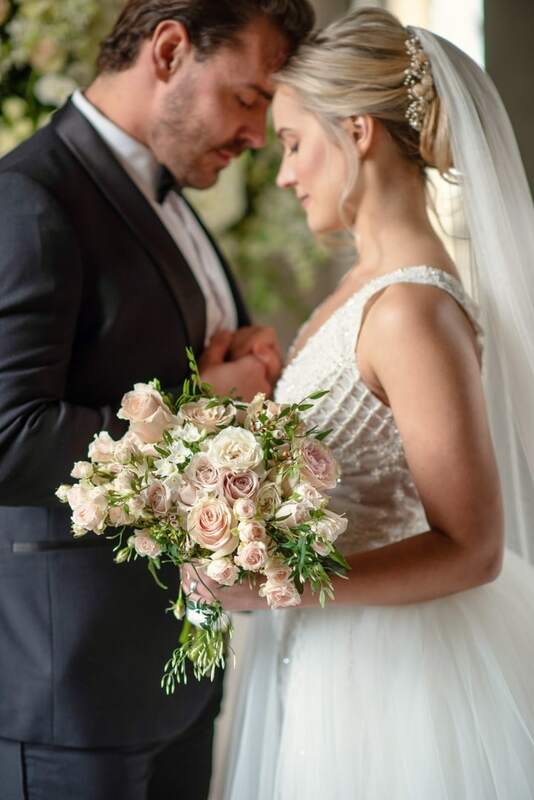 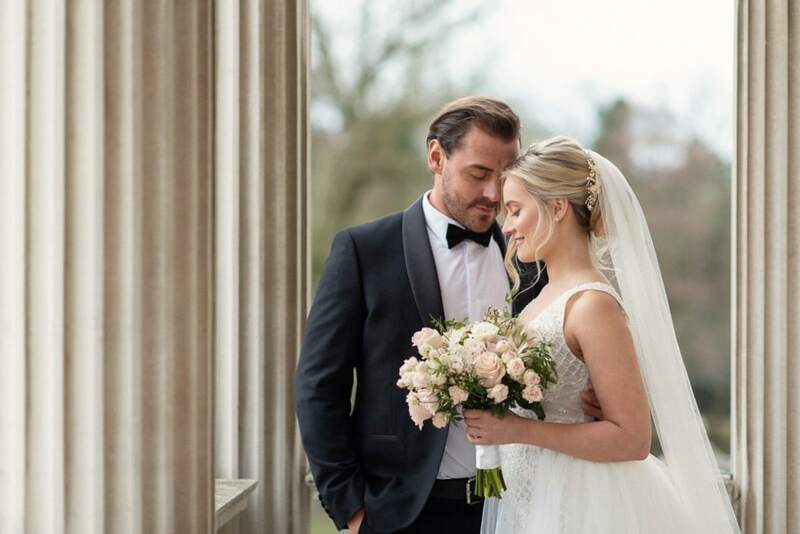 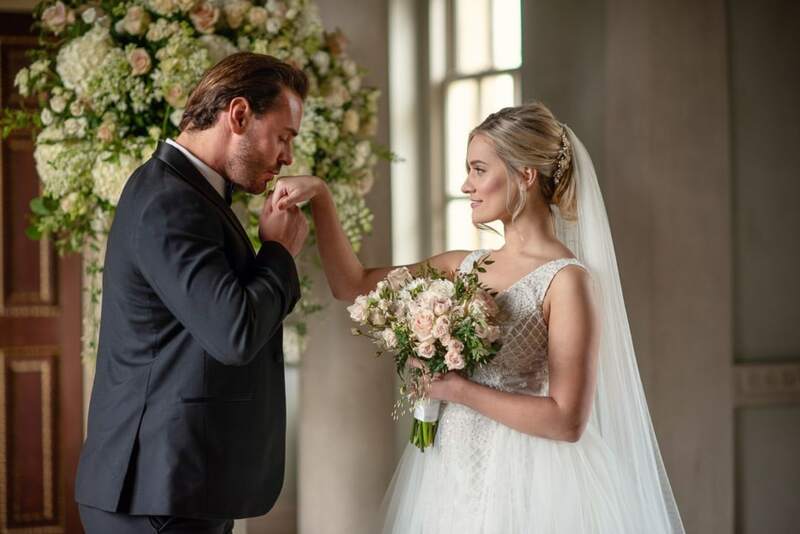 The ceremony for our shoot takes place in The Link Building which is a stunning but often unused space, so it was incredibly important to us to create something special. 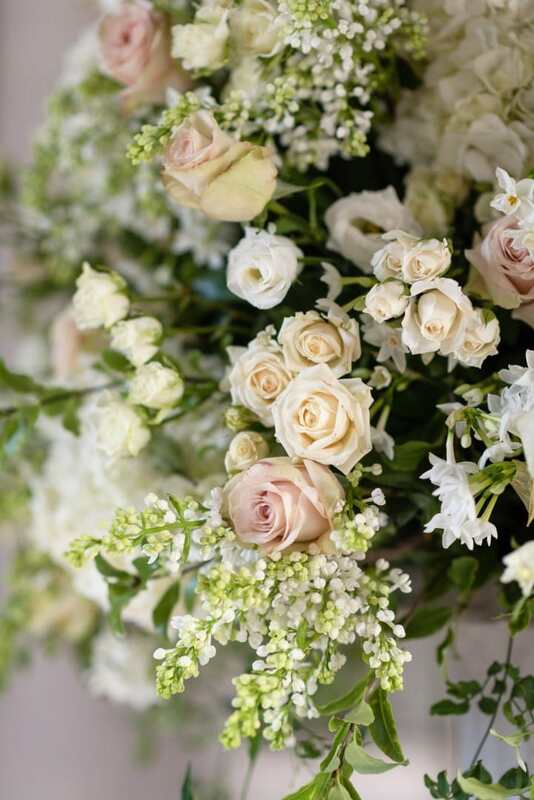 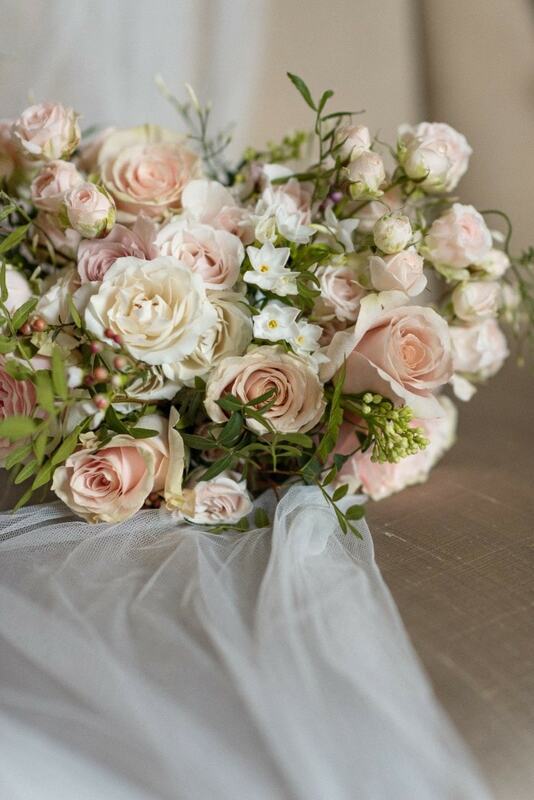 For the Brides bouquet, Mary Jane chose Sweet Avalanche Roses, Bombastic Spray Roses, Jasmine, Lilac, Waxflower and Paperwhite Narcissus. 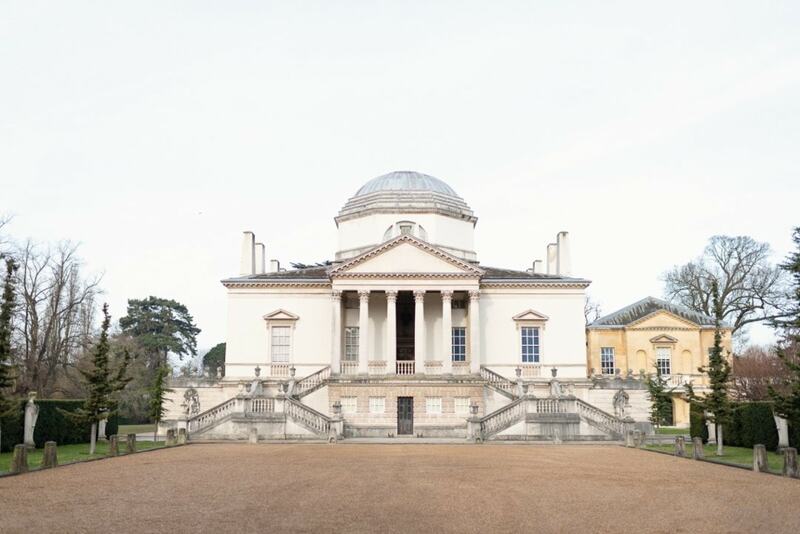 Furniture on the Move provided us with beautiful furniture which complimented the interiors of Chiswick House perfectly. 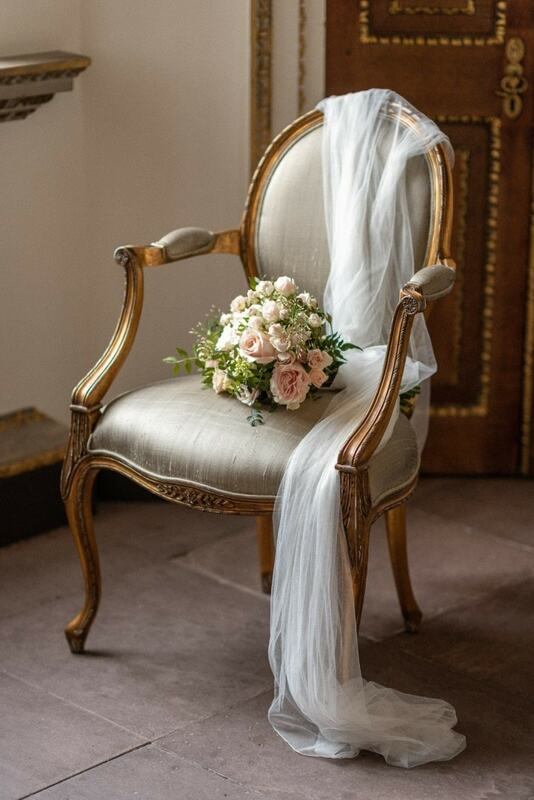 The hand carved frames and beautiful silk upholstery certainly added to the feel of luxury and elegance. 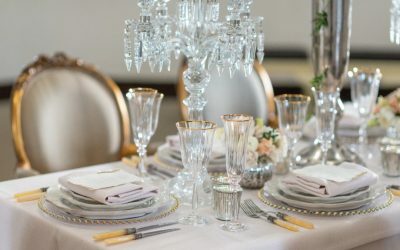 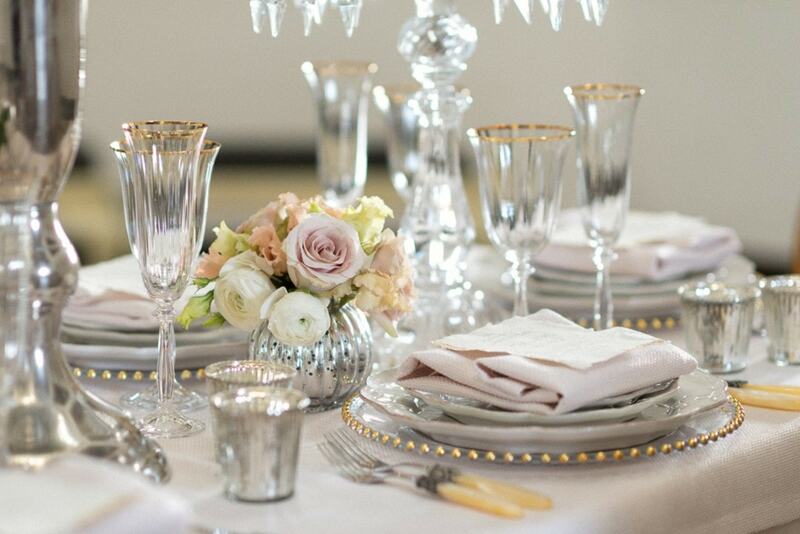 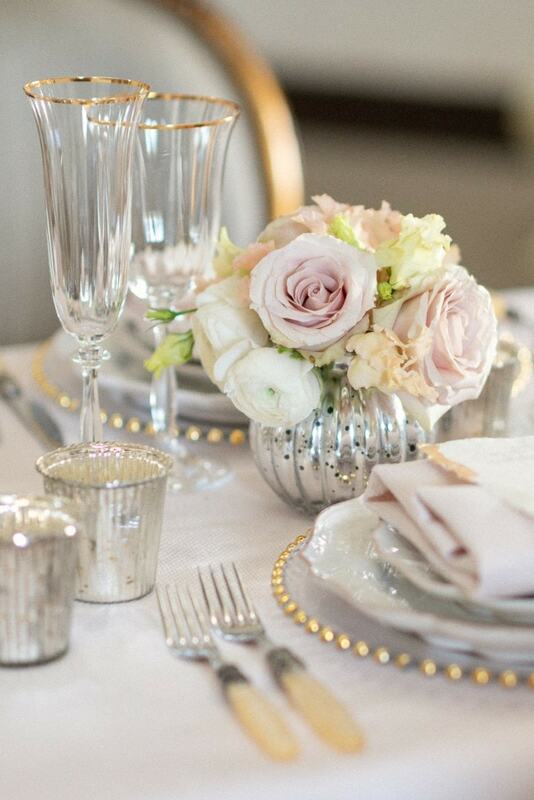 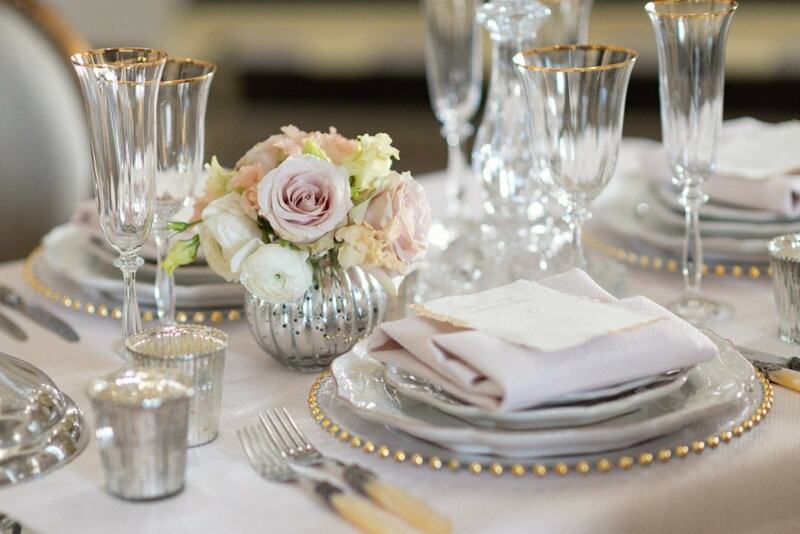 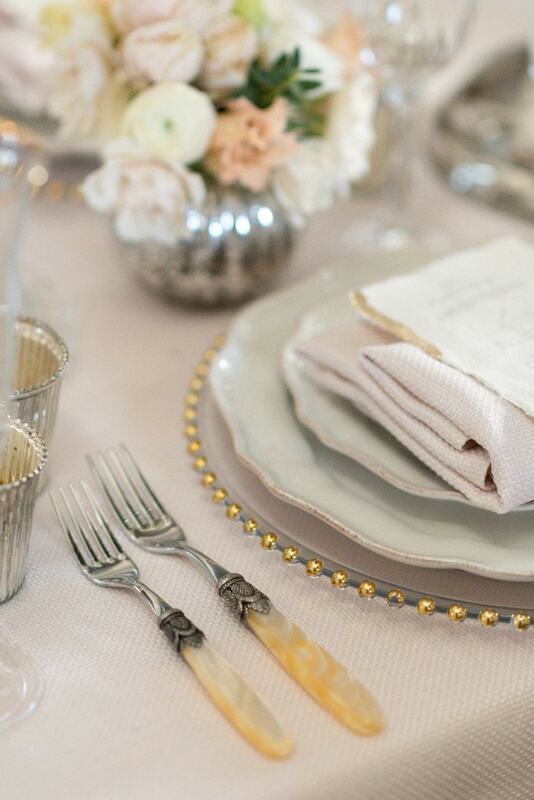 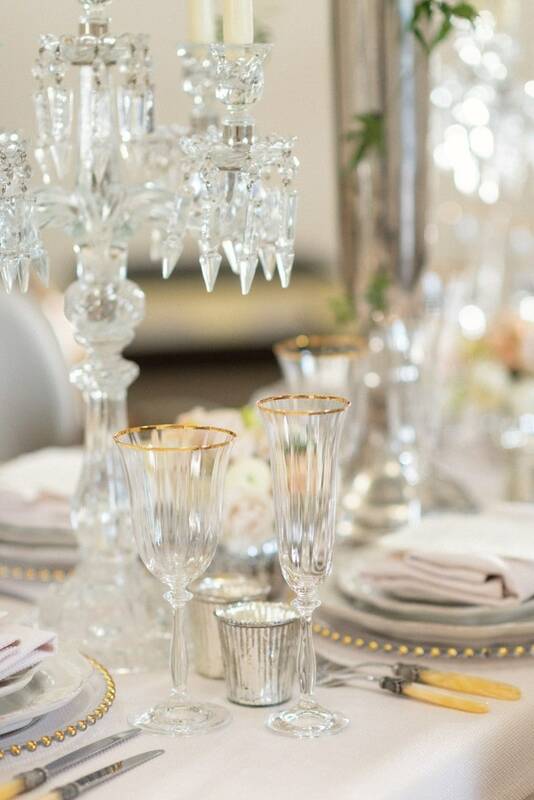 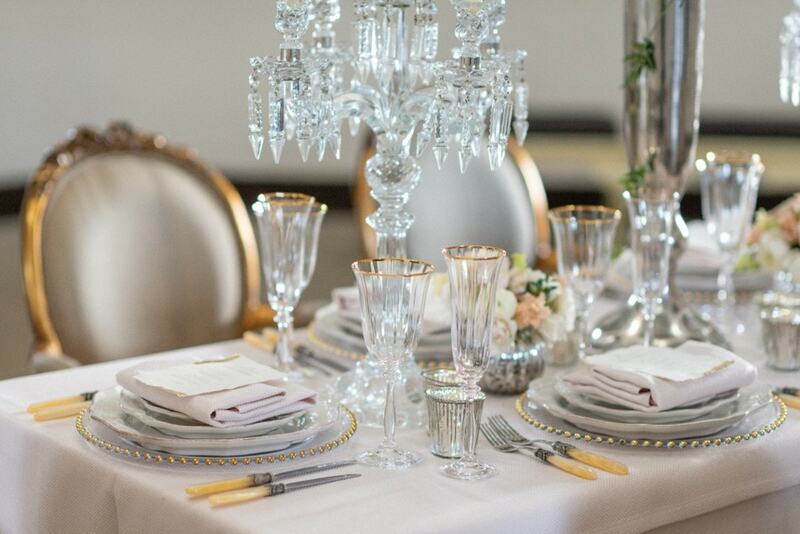 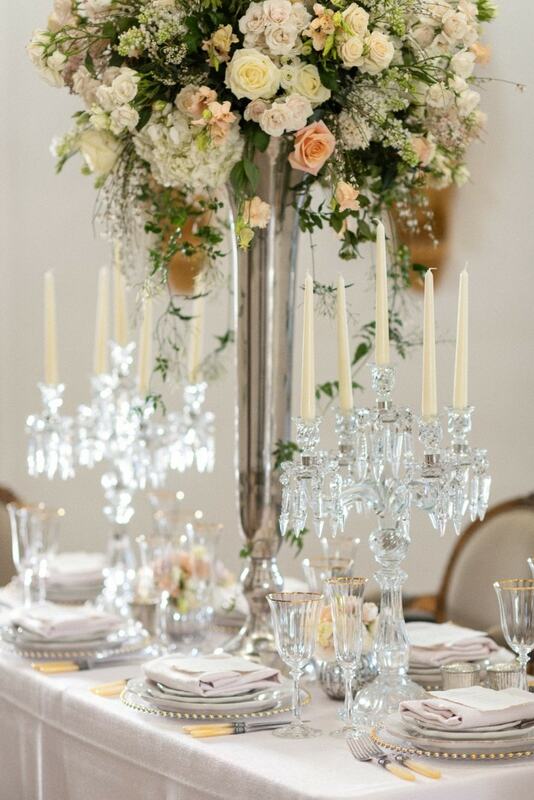 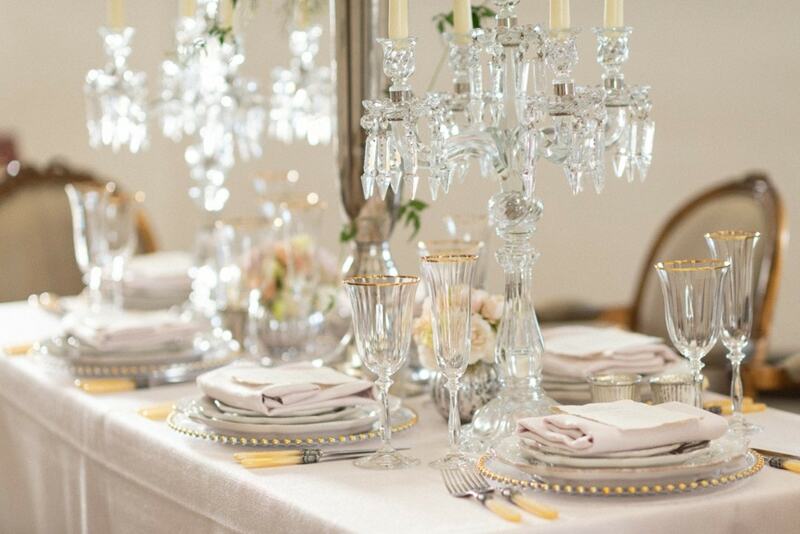 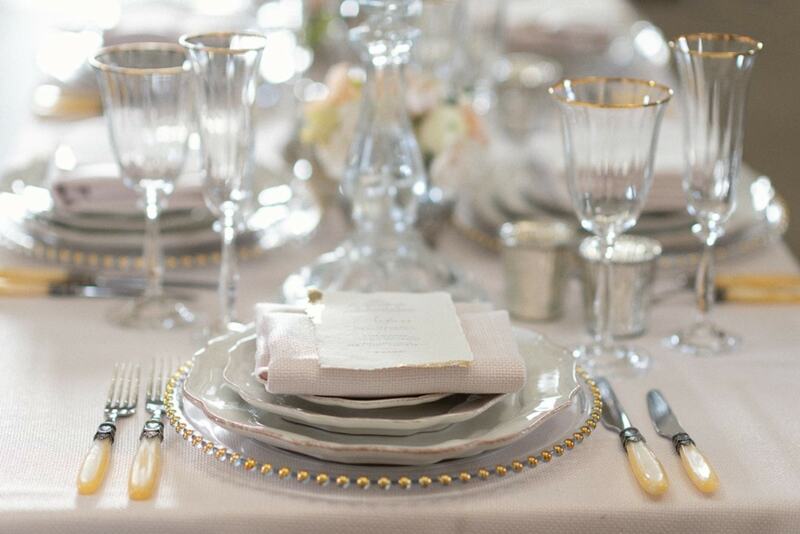 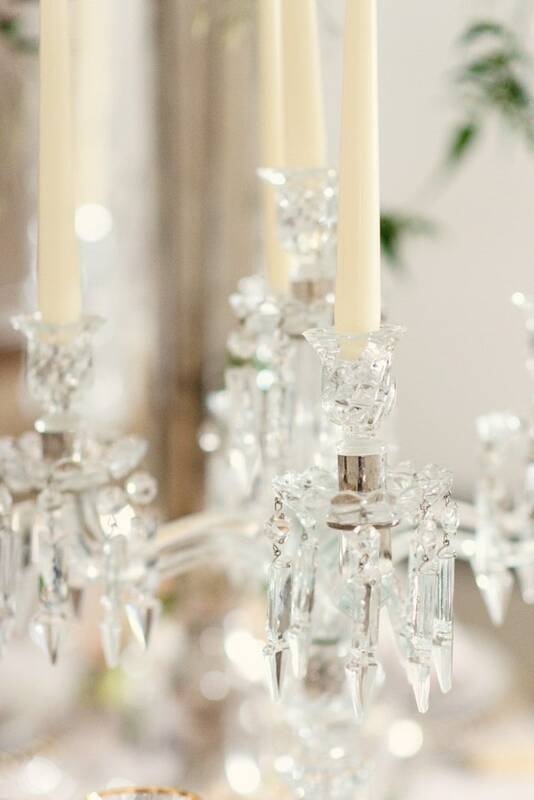 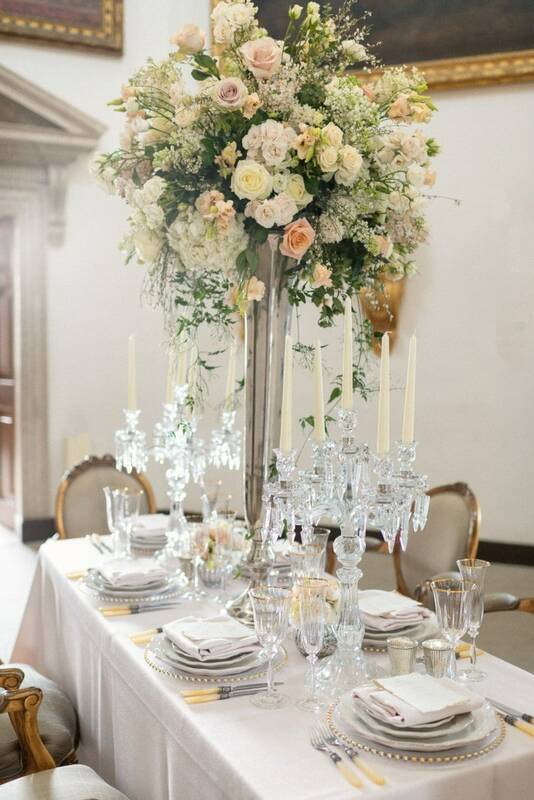 For the table, we chose graceful and delicate pieces such as the gorgeously romantic scalloped edged plates, which were perfectly complimented with stunning cut glass candelabras, gold detailed glassware and elegant mother of pearl cutlery courtesy of The Food Show. 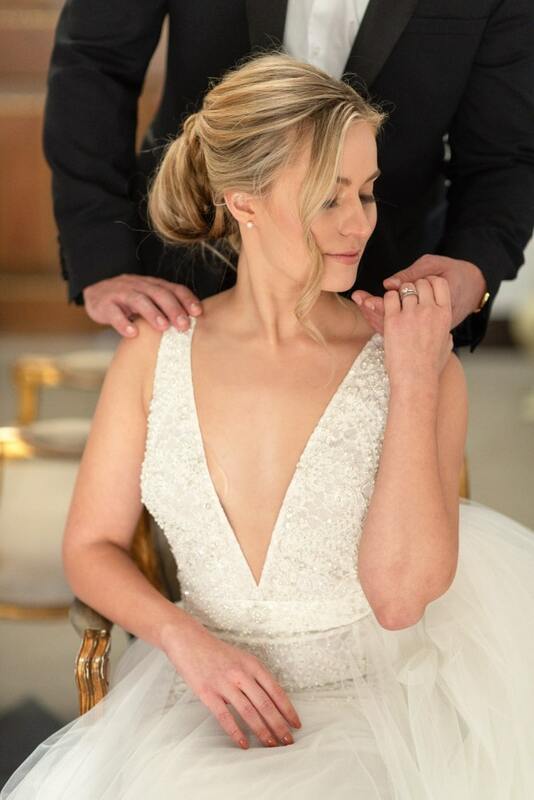 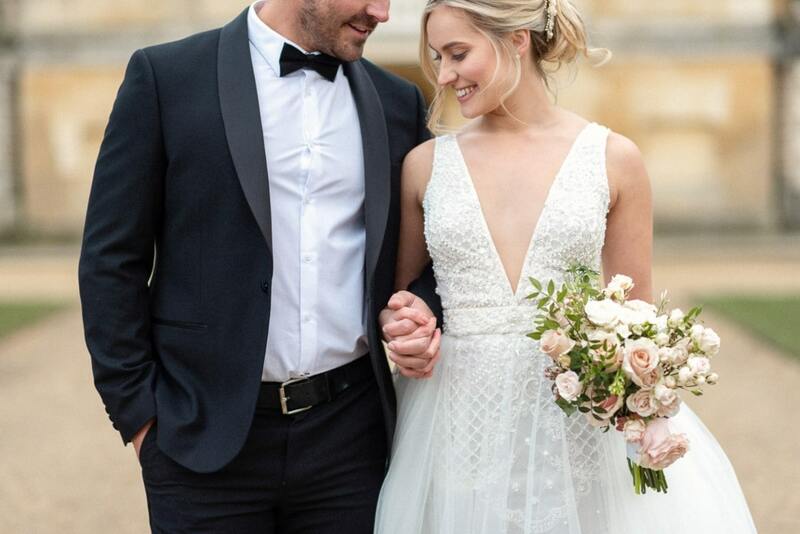 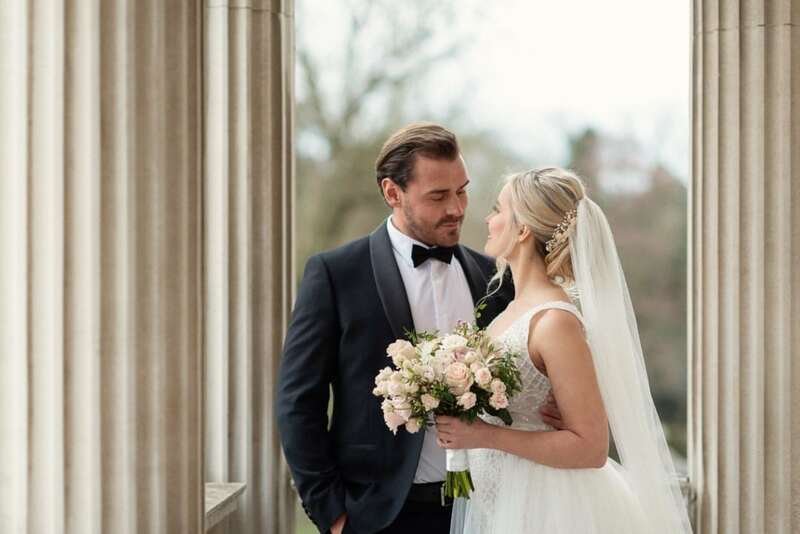 The shoot was planned, designed and styled by Bride and Belle Luxury Weddings and captured beautifully by Eva Tarnok Photography.